When visualizing our children and grandchildren’s future prospects, there are two inevitable happenings that we cannot deny, anymore than we can avoid the deaths of our biophysical bodies: the imminent demise of Western civilization, which underlies the global economy, and the subsequent death of Homo sapiens sapiens. These happenings are inevitable because, by the Principle of Unity—the fundamental design principle of the Universe—all forms that are conceived or born from the Formlessness of Consciousness grow in an evolutionary outer movement, then return to the Immortal Ground of Being through a process of decay and death, as illustrated here. Life and death are simply two sides of the same illusory coin: inseparable. We are thus the first species not only to be aware of our mortality as individuals but also as a biological species. One day, in the not too distant future, a generation of children will be born who will not be destined to have children of their own. No doubt they will learn how to deal with this unprecedented situation as best they can, led by those who have been called Indigo children, questioning the deeply held beliefs of their parents. But maybe those of us elders who have already passed through the apocalyptic death and rebirth process that the younger generations will need to pass through to realize their fullest potential as Divine Cosmic beings in the blazing Age of Light could provide some assistance here. In this respect, we can first note that in the case of us human beings, we are conceived in the mystical rapture of Oneness with all there is, usually being ejected from Paradise when we are born. If we then continue relentlessly on this outward movement through our intellectual learning, through the analytical mind, we become separate from Reality as Homo divinus analyticus, which generally leads to fear and anxiety. The line marked ‘Western civilization’ in the diagram below represents this ontogenetic path. Because our minds have become fragmented and split by the divergent tendencies in evolution, we often create substitute religious or economic immortality symbols to assuage our fear of death and give ourselves a precarious sense of security and identity in life. Using the lives of Shakyamuni Budda and Jesus of Nazareth as models, Joseph Campbell has seen these lives as examples of an underlying pattern in many cultures around the world. In such a ‘monomyth’, a hero is called to adventure, engages in many trials, and then, having found the goal, returns to the ordinary world with the boon he or she has found. This spiritual quest is also symbolized in the fairy tales of the world, where the hero has to overcome monsters, such as nine-headed trolls, to win the heart of the princess or reach the treasure. This deep longing in the human heart is also symbolized by the spiritual quest for the Holy Grail, as indicated by the immense popularity of Dan Brown’s The Da Vinci Code. However, those mystics taking a short cut back to Paradise generally are not concerned about the practicalities in life, dealt with by science and business. So even the mystics grounded in Nonduality are not always consciously being guided by the Principle of Unity. There is still a separation between Western reason and Eastern mysticism, in particular. To heal this deep wound in the psyche, there is another way to return to the Source, illustrated by the larger bell-shaped curve in the diagram above. We can call those on this ontogenetic path exemplars of Homo divinus universalis. It is this middle path between traditional mystics and Western science and business that is the basis of this web site. For if we cannot end the long-running war between science and religion, there can never be Peace on Earth. The central issue now is how can exemplars of the three subspecies of Homo divinus at many different levels in the spectrum of consciousness help each other to realize their fullest potential as Divine, Cosmic beings before Homo sapiens sapiens becomes extinct. In general, people are not conscious of the ontogenetic path they are following in their journeys through life or what level of consciousness they have reached in their journeys at any one time. It is only possible to see the Big Picture on the summit of the mountain of all knowledge, at evolution’s Omega point. Even mystics living in Unity Consciousness in Nondual Oneness do not know of the existence of Homo divinus universalis with Cosmic Consciousness. For, by the Principle of Unity, Wholeness is the union of Wholeness and Oneness. Wholeness is Oneness with a fully healed, translucent mind. Not that this is not a black and white situation, for while we might have periods at one particular level, many have glimpsed Ultimate Reality in spontaneous mystical experiences. For as Wholeness is our True Nature, from which we are never separate, when that which takes us away from Wholeness is quietened, Wholeness is intuitively revealed without having to conduct the holistic experiment in learning that takes us there through reason. Furthermore, people at the second-tier of consciousness, seeking to be free of the seven pillars of unwisdom that guide the first-tier majority, are not clear about the distinction between Homo divinus universalis and Homo divinus divinus. For evolution is both currently changing from a divergent to a convergent mode and changing from evolution to involution. Of course, all these distinctions are products of the analytical mind and do not exist in Reality; they are simply appearances in or abstractions from Consciousness. And when we rest in Wholeness in this manner, there is really nothing to do. Nevertheless, all of us are both human beings, waves and currents on and in the Ocean of Consciousness as well as the vast Ocean in its entirety. So, as such, all we can do is help people awaken to Total Revolution as evolution passes through the most momentous turning point in its history. Not that this will be easy for in general, when a new species or civilization emerges from a previous one, those individuals embodying these radical changes have a pretty hard time of it, for all structures have a tendency for self-preservation. 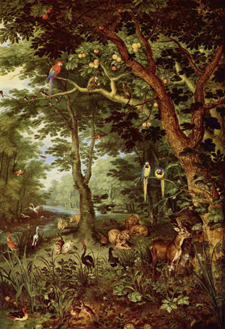 Under these circumstances, it is pertinent to note that Jan Brueghel the Younger’s famous painting of Paradise from 1620 contains only plants and animals; human beings are conspicuous by their absence. There is thus just one remaining question to be anwered: Can we human beings collectively return Home to Paradise before the fearful, egoic mind drives all species in the Homo genus prematurely to extinction? Who are we? Humanitys place in the overall scheme of things. Whoever does not hate father and mother as I do cannot be my disciple, and whoever does not love father and mother as I do cannot be my disciple. For my mother gave me falsehood, but my true mother gave me life.